Added on 06 September 2018 . By Olivia Cheves. 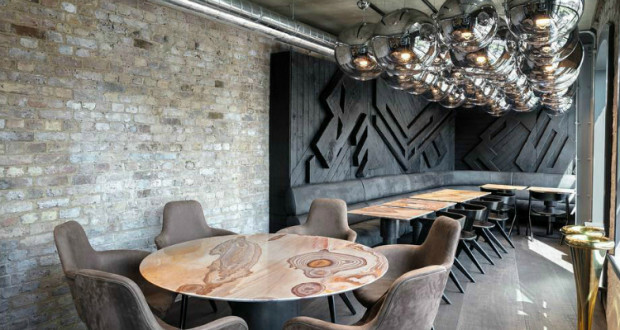 Located in Tom Dixon's newly refreshed HQ, this undeniably gorgeous eatery is a collaborative effort between the British designer and Israeli-born chef Assaf Granit. Part of Dixon's recently refurbished Coal Office complex, it's the perfect place for a bite to eat between checking out the goods on offer in the showrooms and flagship store - in fact all the tableware from the restaurant will be available to buy in the shop. Offering as much on the food front as it does on the style side, Assaf Granit has brought the same innovative cooking that made The Palomar and The Barbary such successes to this latest venture. Inspired by Middle-Eastern cooking and keeping a focus on beautiful and creative plates, Granit has crafted a menu that will be a feast for the eyes and the stomachs. From delicious small plates such as kingfish sashimi with a ginger vinaigrette and fresh fattoush salad, to larger mains including seafood chraime with tomato and pepper stew, or freekeh risotto with green wheat and skordilia cream, you'll find innovation and delight in every bite.